The Players move between Levels. 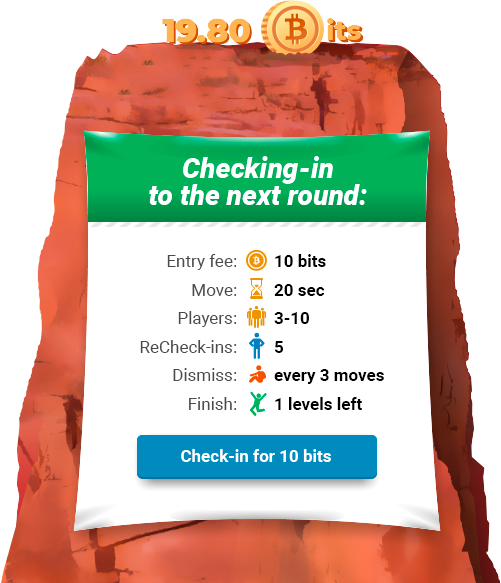 At the beginning of the Round, those who wish to play, check-in at a fee and are placed at Level 0. The goal is to reach as higher Level as possible. 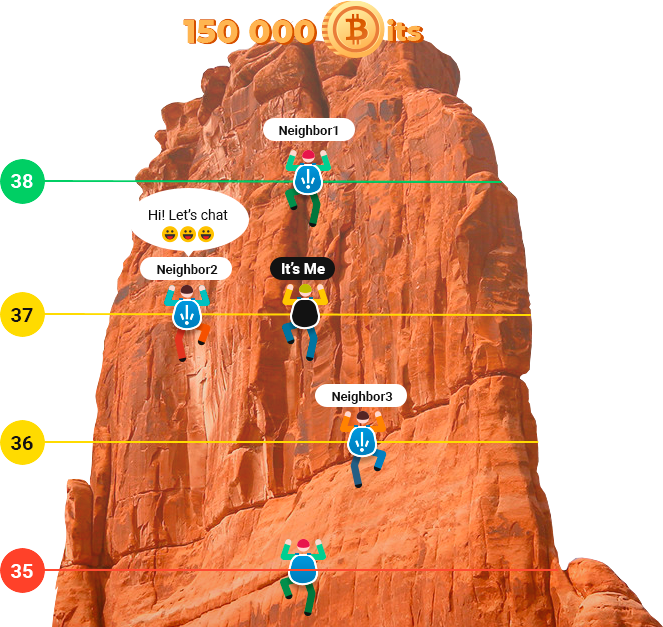 Climbing to the next Levels is only possible by interaction with other players (referred below as "Neighbors") – those who are on the same or nearest Levels. To play this way, the Player does nothing (it is default behavior). button in some Rooms. By clicking it the Player "drowns" one of his/her randomly selected Neighbour. You would probably understand this rule better if you imagine that climbing people can only do each step up with the help of their neighbors (e.g. step on his shoulder, and, in turn, set the shoulder to him). There is also "Win/Loss" log, where you can see every change of your balance during the playing in specific Room, and "Full" log with all details of every Round in specific Room. Who and when w ns? The Player has a choice of one of several game Rooms. The fee for the initial checking-in to the Round is fixed for each Room. For example, “Trial” Room requires 25 bits for initial check-in, “Big Guys” Room requires 300 bits and so forth. 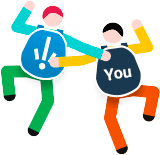 During Checking-in, the amount required is indicated on the blue "Check-in" button on the banner – if you agree, just click it to join the Round. The initial Round check-in fees and the fees for re-entrances are put into the Round Pot. When finish condition occurs, the round ends and the winners - players who left in the Round- gain the Pot content exclusive House Edge (1%). If more than one Level wins, the occupants of highest Level gain 70% of the pot, occupants of the next Level gain 70% of the Pot and so on. There is a common quota for all Players of such check-ins for each Round. In this case the Player pays <Round Pot>/ <Number of active players>. At last, the dismissed Player can re-Check-in again. The rules in this case are the same as above. 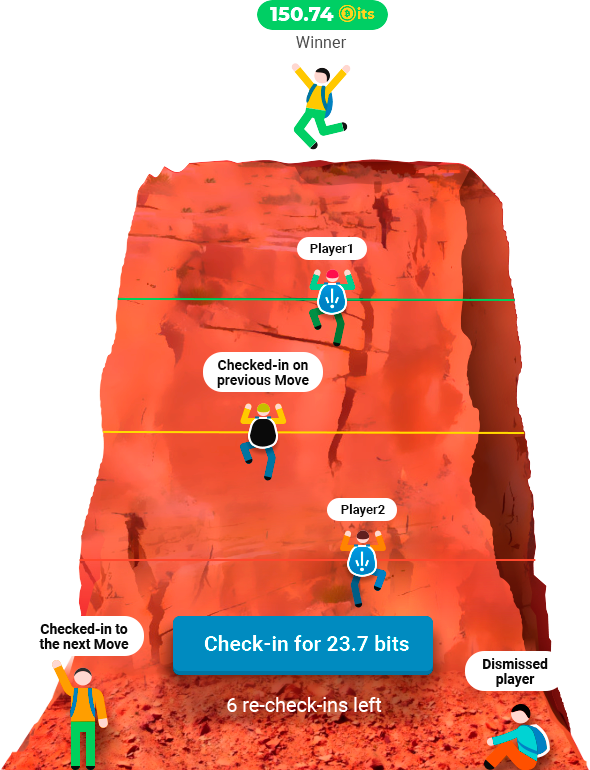 The Player can enable his “personal bot” to act in his favor. For this, there is a control panel on the upper right side with the familiar "Play/Stop" button. By clicking "Play" you order the bot to play specified number of Rounds, but to stop at loss more than specified amount of bits. In the name box you can choose one of the bots, created by other users, and, after selection, run them or edit to create your own bots. Note: even if the bot is stopped ("Play" button displayed), it will finish the Round for you in case of connection lost. Since there are a lot of different bots, it's not so easy to select the best for your needs. For choosing a bot for playing in specific Room, first select the bots, played in this Room solid amount of Rounds, for example, 200 or 500. In the "This Room rate" column, you can see how effective was each bot in terms of bits earned as persent of his total bits wagered. Obviously, the more - the better :). However, as one can guess, it's not so easy as it looks like.. Below you'll find some basic tips for choosing the right strategy. When creating your own bot or edit other Player's one, you have to set two kind of parameters: "Pounce" and "Revenge". Setting "Pounce" you specify, how often the bot will drown another Players on different Levels - upper, your own and lower ones. Tip: Efficency of the bot depends on the strategies of the other players in the Room. For example, if the most Players run very "peaceful" strategy, your agressive stragegy will loose. The "peaceful" means the strategy with small Pounce probabilities, like #145 "Peaceful Hippo by Lifehacker4". "Agressive" strategy, in contrast, has high probabilities, like #17 "90-70-11 by Fly". From the other hand, if you are playing in the Room where most of Players are agressive, you have to be agressive too. In "Revenge", you specify the "penalty points" which another Player got for drowning you. If you are not very vindictive (recommended), set the points for drowning on Move-2 and Move-3 less than for Move-1. If the total points for specific Player will exceed the value in "If points total >", the bot will drown this Player as revenge. Tip: To win, it's absolutely necessary to revenge other Players for drowning you - "EYE FOR EYE" (to drown if have drowned in previous Move, see #184 "Eye for Eye by admin"). This rule has some variations like "EYE FOR 2 EYES" (when you drown only if have drowned on 2 preceding Moves, see #185 "Eye for 2 Eyes by admin") and others - try it. Again, the right revenge strategy depends on strategies of other Players in the Room, so it's smart, when running the bot, to check your gain from time to time and change the strategy in case of loosing. Another strategy option is to allow the bot to re-checkin to the Round when dismissed (additional fee is applied, of course). Try yes and now and see the results. At last, you can specify, if the parameters of your bot will be seen by other Players and if they will be able to play with it (the "public" checkbox). If you are aiming to win, it's wise not to show your strategy to other Players. However, there are some Rooms, where only public bots are admitted. What s the game currency? The game currency is called “Bit”. A bit is a millionth of a bitcoin (microBitcoin) or 100 satoshis. How to deposit b ts? You will need to transfer bitcoins to the deposit address on the Deposit page of your account. If you do not have any bitcoins, you can search online to see properly exchanges or bitcoin ATMs near you. If you still don’t have a bitcoin wallet, you can deposit bitcoins without it, directly from exchange to your deposit address. However, to withdraw and use your funds later, you will need a bitcoin wallet; we recommend Jaxx. Your deposit address is permanently attached to your account. You can save it, or use it for automatic funding, or whatever else you like. All payments to this address will be automatically credited to your account. On the Withdraw page of your account, you can send bits to any bitcoin address you want (Bech32 / native SegWit addresses currently not supported). They are processed instantly and you will be given the transaction ID immediately. We charge 50 bits from any withdrawal amount to cover mining fees. We do it regardless of the actual mining fees attached to the transaction, which may be more or less than this, depending on the block competition at the time of your withdrawal. Withdrawals must be in increments of 1 bit, with a minimum withdrawal of 150 bits (of which 50 bits goes towards the mining fee). The maximum amount you can withdraw is your balance - faucets total amount. Located on the bottom right. 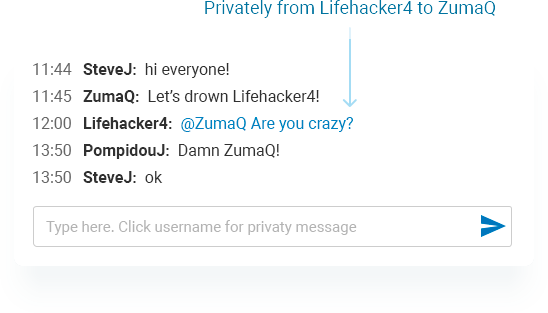 Just type to publish a message to everybody, use @<UserID> to send a private message. 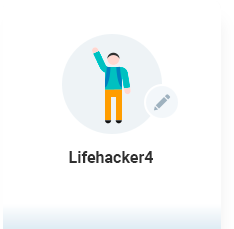 You can also click the UserID on the rock to insert @<UserID> to the input string (while right click shows Playre's public profile). These strategies are mostly of group type. For example, in the beginning one group could agree to play in cooperation against another one, – but then, if they succeed in dismissing them from the round, the group members should compete against each other to win. Another type of strategy is choosing between “Drown” and “Cooperate” actions depend on the Round stage. The "drowning" of another player gives faster climbing, but, on the other hand, attracts more attention of others, especially those who were “drowned” by you, which could lead to your “drowning” from their side as revenge. It seems wise to "drown" others only upon urgent conditions – e.g. when you are on the red Level and are going to be dismissed or the end of the Round is near. But remember that all your “Drown” acts are counted and will be displayed to others, – and their behavior towards you will depend on it. And last but not the least, keep in mind that the more Neighbors you have (you can easily recognize them by buttons on their backpacks), the more Levels you climb in one move; one for each Neighbor, as long as all play fair. So it’s wise to stay at more inhabited Level. Note: If two or more Players are in collusion, they have great advantage against others playing manually. Since it's very difficult to reliable detect such case, at the moment the manual playing is only allowed in one "Newbie" Room with mimimum check-in fee. Later, we're planning to qualify some users to higher ranks (after insuring that they have no more than one account) and to create manual playing Rooms where only high rank Players will be admitted.